Here’s an interesting weekend post from reader David Evans, who asked a good friend what shops she recalled from her childhood in Walsall Wood. Can you add to these? All contributions gratefully received. This old photo shows the High Street looking North, with the canal behind the photographer.Picture taken from 'Memories of Old Walsall Wood' by Bill Mayo and John Sale. 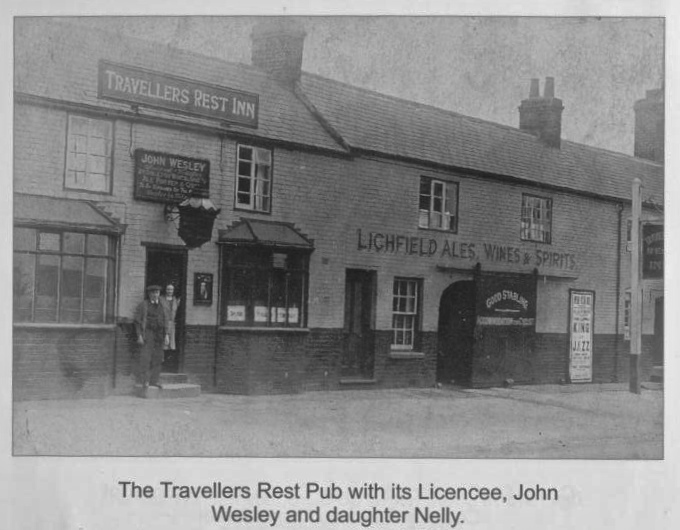 The Traveller's Rest: it was a sizeable hostelry. Image from 'Memories of Old Walsall Wood' by Bill Mayo and John Sale. Matt Cherry a barber who cut the ladies curls off! This entry was posted in Brownhills stuff, Environment, Features, Followups, Fun stuff to see and do, Interesting photos, Local History, Local media, Reader enquiries, Shared media, Shared memories, Social Media, Walsall community, Walsall Wood stuff and tagged 1930's, 1940s, Bill Mayo, Brownhills, Brownhills local history, David Evans, High Street, John Sale, list of shops, Local History, Memories of old Walsall Wood, New Photos, Pubs, Staffordshire, Traveller's Rest, Walsall Wood, Walsall Wood Shops. Bookmark the permalink. As a young boy I was born in Walsall wood at my grandparents house 7 salters road ,the picture of the travellers rest brought back memories of times when I used to play in the back yard ,whilst my father drank in this public house with Frank Cooper (coal merchant ) .I can vaguely recall was there a blacksmiths next to the travellers rest as you walked down the bridge?. whent to brownhills boys high school was also in the army cadets when Tom sedgwick was the captain thire . i am now liveing in Australia came hear in 11967.Bob could you help fiend a photo of three Army Cadets Sgts who whent to the army cadet Bi centehary at Buckingam palace around about 1959. The shop at the Vigo intersection was “Knights”. The premises also had an outdoor beer licence and consequently a large cellar. This was used as an air raid shelter for local people during the war. I spent many uncomfortable nights in there, myself. Mr Cooper was always “Cobbler Cooper”. to the locals. There was another little shop, Martins, only a few doors away from the one mentioned. Ray may also remember Mr Schnabel the plumber and Adam Smith who sold milk door-to-door, both only a short distance from his former home. to Ray and Roy in Australia…very many thanks for your notes. Super. Most summary sheets show only the word ‘shop’; as you will see this census enumerator has been more helpful. If there are any photos of John Derry and the Green grocers i would be most grateful. if you link to Sue Lote’s Walsall Foreign..front page of this blog..I think there is something about Derry living near Goblins Pit..going to USA, Mormon church preacher etc..Good luck.. May be the same family! 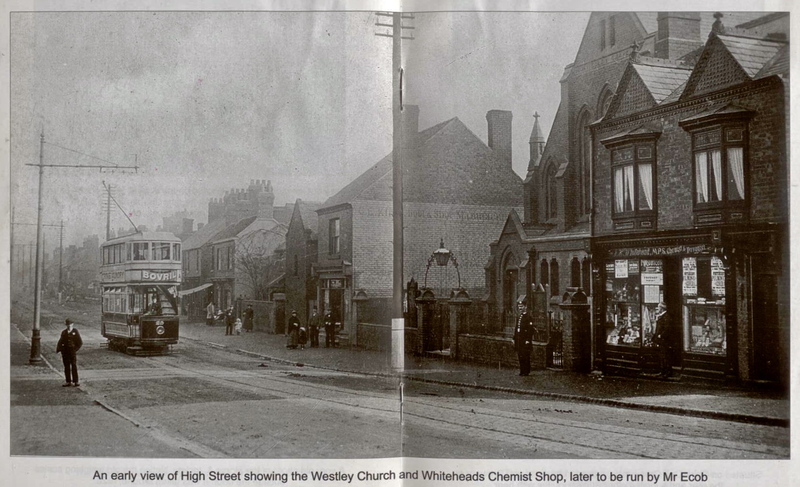 There may some follow up article in this blog..
Hi yes Swindonia is a family name, and I have heard the Red Lion mentioned within the family, I believe John Wesley also owned a shop which another daughter ran he also owned property on coppice road that he rented out as well ? Thanks for replying.